Query; if we’re calling this thing 24 Days of Tea, do we have to start reworking the header along the lines of ‘The 12 Days of Christmas’? Make that the nth reason why we persist in talking about an Advent Calendar, shall we? Apologies to the atheists and agnostics out there, sincerely, but we still go to church, still observe Advent, and we really, really, really hate playfully inventive headlines. Writing them, that is. Look ye elsewhere for those. Other notes include the observation that while we’ve now tried the new plastic-wrapped tea approach by the calendar, we prefer the tins. Yes, the tins were hard to open. Yes, they frequently vexed us. But we had a whole system. Take a teaspoon, gently lever it under the lid, prise the lid up, and twist open. It was a good system. It worked. What can we say? No one has the market on Grumpiness and Apathy to Change cornered quite like the Anglican Communion. Our working theory is that this too is about inclusivity. See, ever since the sharp decline in church attendance, we swapped the icthus for the tea tin. 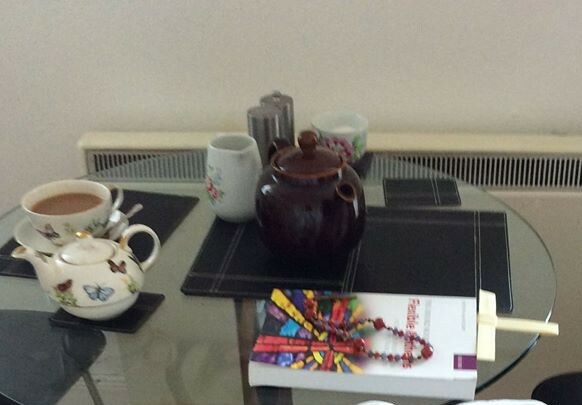 The Anglican Inquisition now covertly hands tins of tea to its members to signify fellowship. It’s a superior option to cake or death, but it does rather leave people out in the cold. We will now bond over the experience of the fiddly plastic tea bag, atheist and Anglican alike. All while singing The 24 Days of Tea. Tell you what, give us time and we promise to warm up to this brave new world where tea is plastic-wrapped and Advent is bad marketing. We’ll try really hard. Tomorrow. Today has been long. It was Advent I, so Mass had everything including the kitchen sink at play. We lunched with a friend and attended a Christmas concert that, while lovely, had clearly been read the same marketing memo as the tea people. On the other hand, they stuck doggedly to the ‘original’ lyrics to ‘Deck the Halls’ (inasmuch as these things have original lyrics) so maybe that balances out the ‘Boogie Woogie Bugle Boy’. Now we’re unwinding after it all drinking cinnamon roibos. It’s the perfect way to relax, and comes highly recommended. It also doesn’t taste terribly of cinnamon, which is odd, because when we wrestled the tea from plastic wrap to tea infuser, we definitely saw cinnamon pieces. It smells of cinnamon though. Given the history of these things to smell of things they are not, this is no small victory. This isn’t necessarily the fault of the tea. Roibos is the kind of tea that comes naturally spiced; taste-wise, certain varieties aren’t miles from cinnamon-flavoured anyway. To overwhelm that and bring secondary flavours through, this is a tea that has to steep an exceptionally long time. Twenty minutes later and the second cup had definite notes of cinnamon to it. It was lovely, but you won’t be making this up for a quick cup of anything before breakfast. If you survived all that, have tea and a biscuit. And then, just to prove we don’t take it all too seriously, have a poem that pokes fun at any Anglican that dares try. Just make a little circumambulation of the altar. And because it’s Advent I and a Sunday, that means music. We move from the ridiculous to the sublime, because, while we can be irreverent about tea and even the liturgy, music is definitely sacred. Here’s a piece we play on a loop right through until the calendar says it’s officially Christmas. Enjoy. Posted on December 2, 2018 December 3, 2018 by ClairePosted in StoriesTagged Advent, Anglicanism, Church, music, poetry, Tea.